Great Ampeg tone at levels made for practice. 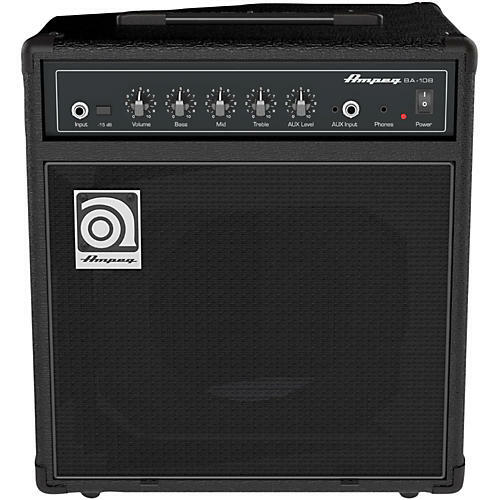 The Ampeg BA-108 8³ Bass Combo delivers classic Ampeg tone and performance-driven features in a highly-affordable package perfect for practice. Its special design features a true 60-degree sound reinforcement monitor angle that adds clarity in any situation. The front-facing panel is easy to access at all times with great features like a headphone out and line in to practice silently with your mobile music device. Built to last, the rugged enclosure features an all-steel amp chassis and protective metal corners. Decked out in black with front facing controls, the BA-108 is an extremely professional practice amp for the money.